We returned back to the General speakers list the first half of debates today, with the delegation of Peru reiterating the need for humanitarian aid in Hungary. 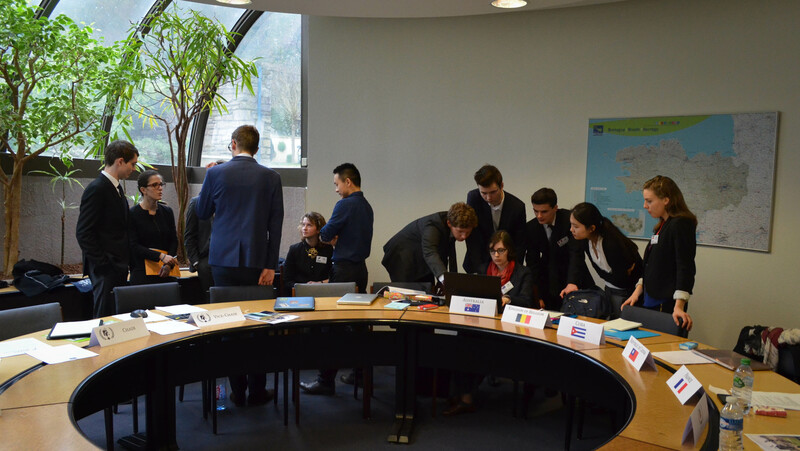 A moderated caucus was called by the delegation of Australia to discuss the stabilization of the government in Hungary and the maintaining of this government after. Questions were raised in response; such as the kingdom of Belgium’s: Will such a delicate situation see these measures as an interference of foreign power? France and the United States of America wanted to know how to stabilize a government conditioned to the presence of soviet troops. During the caucus the chairs informed us, that if a delegation is absent and the voting procedure is called for, the absentee’s vote counts as an abstention, and thus their veto, if they have one, is null. Coincidence of all coincidences, we did happen to have a very powerful delegate missing from the morning debates! 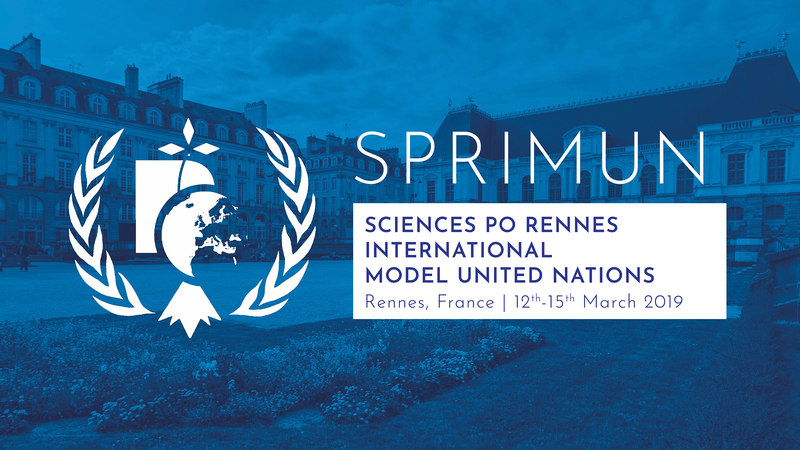 This announcement caused an admirable speed to the delegates’ motions, and the resolution that was passed, was, quite possibly one of the fastest passed resolutions at MUN. An unusual but obviously highly effective strategy, and quite a neat answer to the question of the USSR’s veto. Well-done delegates of the historic Security Council for your speed in coming together! And thus, before even the coffee break we were bustling along to the second topic on the agenda- the Suez Canal Crisis. The Canal is an extremely strategic and valuable trade route between the Mediterranean Sea and the Red Sea. Until the canal was nationalized by the president Nesser, the canal management was overlooked by France and Great Britain. The nationalization of such a desirable asset provoked high tensions between the countries. Egypt was then invaded by Israel, and following close by on their heels, France and the United Kingdoms. Their goals were to regain western control of the Suez Canal, and to remove the Egyptian president from power. We rejoin the 7th of November 1956. The delegations of France and the UK have agreed to withdraw their troops from Egypt’s sovereign territory, but the management of the canal is still a mystery. Two opposing groups form very quickly, each a triumvirate. France, the UK, and the kingdom of Belgium make up one side and the USSR, Yugoslavia, and the USA on the other. The general information as follows: the canal is an international waterway, but as it happens, directly in Egyptian territory. Such an invasion by foreign powers constitutes a violation of the sovereignty of the state of Egypt, as well as a violation of their right for self-determination as a people. This opinion is clearly felt by many of the delegates in the room. On the other side, the opinion that an international consortium should manage an international waterway, and that the reason Egypt was invaded was in response to the threat of Israel already present. So where do we go from all the confusing swirl of differing opinions? Little groups broke off to form their working papers, though one stood out from the rest. 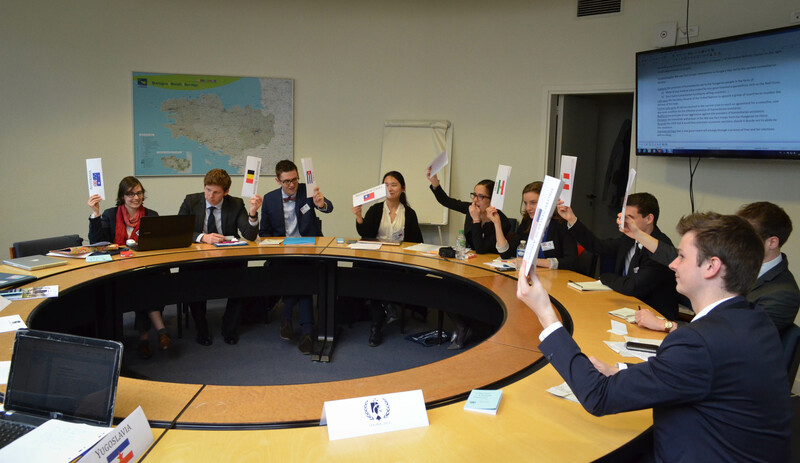 The delegations of Australia and of Belgium really stepped up to the plate with a working paper that combined not only their own solutions, but elements of the other working papers too, creating a final product that a majority would favor in vote. Very smart playing of the game. But, even with this general positive reaction, their were of course still things up for debate- namely, the preamble clauses. Certain delegations were angry that the USSR would not make concessions, but the USSR stood by their opinion that certain clauses implicated the government of Egypt in the fault of the crisis. We’ll be recommencing the debate tomorrow morning bright and early, and we’ll be there to report the results! With a smaller comity like ours, every delegate put their voice in the subject. Even so, we welcome some more power players into the fold. 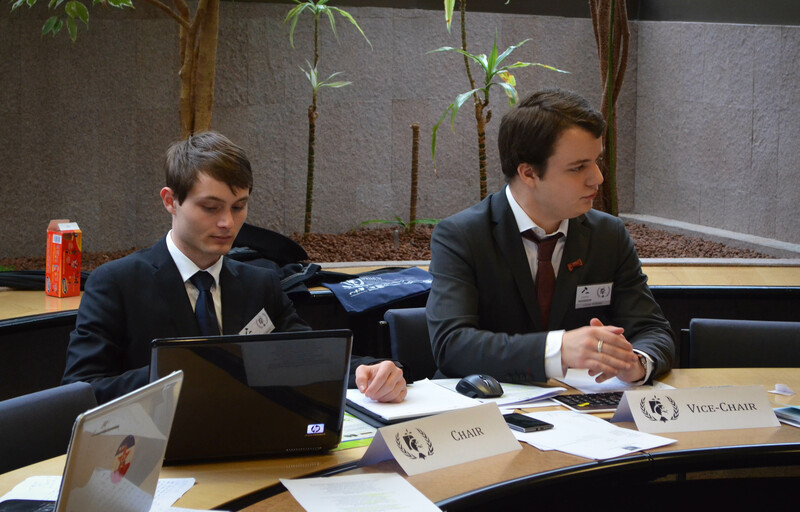 The delegations of Cuba and Yugoslavia offered insightful commentary and questions that kept the rest on their toes!